Seating is open. There isn’t a bad seat in the house! Discounted Group Rates are available for groups of 10 or more. Call (949) 445-3674 or email for details. 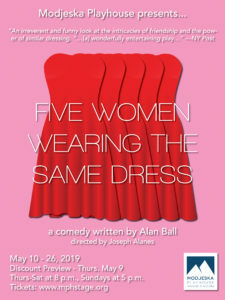 FIVE WOMEN WEARING THE SAME DRESS - Thursday, May 23, 2019 at 8 p.m. In Alan Ball’s hilarious comedy, Five Women Wearing the Same Dress, five very different bridesmaids find themselves hiding together in an upstairs bedroom, hoping to escape the wedding reception of a bride that -- they soon realize -- none of them really like! There is Meredith, the rebellious little sister of the bride; Frances a highly religious, but sweet cousin; Mindy, a blunt, good-hearted lesbian who is the sister of the groom; Georgeanne, a friend from high school whose marriage is falling apart; and Trisha, a jaded beauty whose pessimism and doubts about men are proved false when she meets Tripp Davenport, an usher at the wedding. In this cramped bedroom above the wedding, these five identically dressed women talk, laugh, argue, cry, console one another, and slowly become friends. Thurs-Sat at 8 p.m., Sun at 5 p.m.
$20 Preview Night - Thursday, May 9 at 8 p.m.
SIGN-UP FOR OUR NEWSLETTER (on the homepage) FOR DISCOUNT CODES! GROUP RATES: Parties of 8 or more call: (949) 445-3674.